From Wikipedia: "topology (from the Greek τόπος, place, and λόγος, study) is concerned with the properties of space that are preserved under continuous deformations, such as stretching, twisting, crumpling and bending, but not tearing or gluing." Topology is large and core area of mathematics which is used in many other branched of mathematics. There are many accessible topics that make for projects. What happens when the Mobius strip is cut into halves, thirds and so on. Investigate and understand this by representing the strip in 2 dimension sketches. The Mobius strip can not be "oriented". This means that if you live purely on the Mobius strip you can not agree on what a standard xy-axes look like or the difference between your left and right hand. Learn about "orientation" in mathematics. 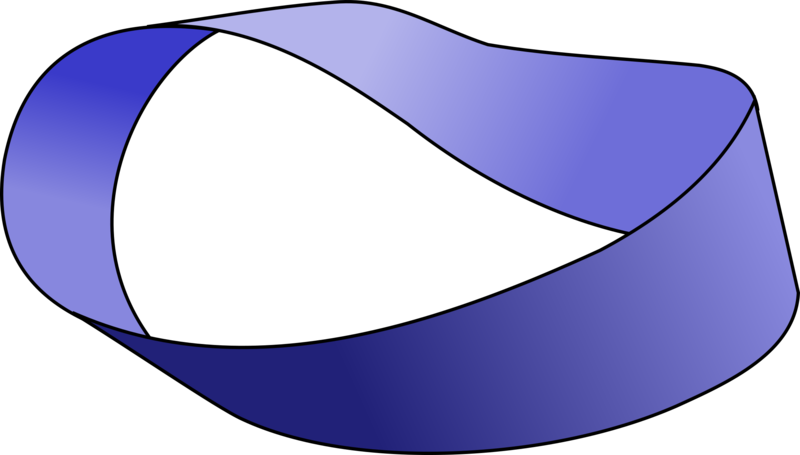 A four dimensional version of the Mobius strip in the Klein bottle. The Mobius strip is used in a beautiful way to prove the inscribed rectangle problem (that on every curve you can find 4 points which are the corners of a rectangle). This is an easier version of the still unproved inscribed square problem. Knots: Knot theory is an important part of topology with applications in other areas of mathematics, quantum physics and biology. The early history of knot theory in mathematics was doe to Lord Kelvin's idea to used knots to explain the existence of different types of atoms. The "un-knot" is just a circle. To the right is a picture of the trefoil knot. This knot and its mirror image (reverse all the crossings) are the only knots with three crossings. 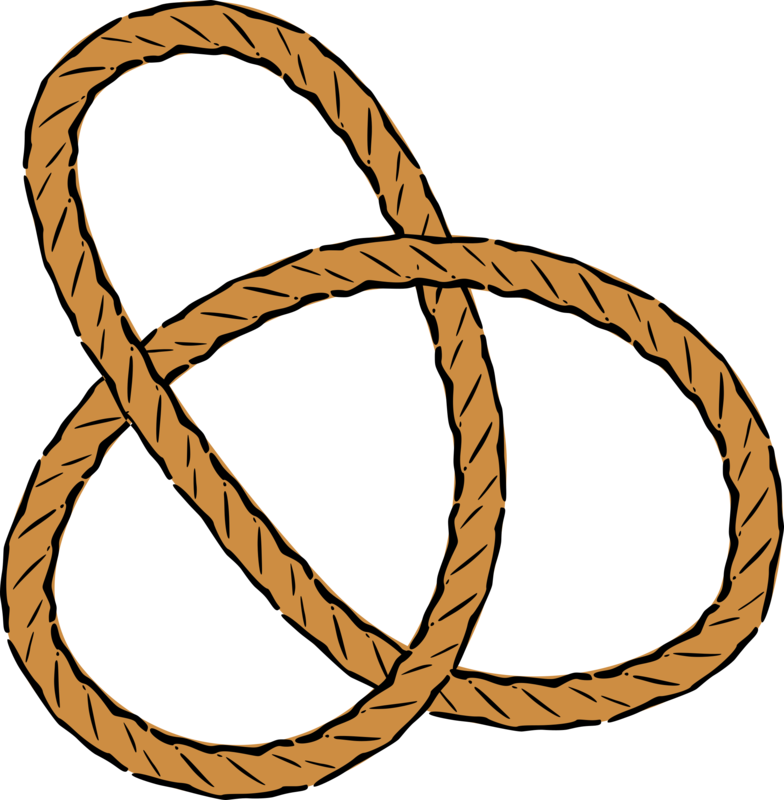 Justify to yourself that the trefoil knot is different than the unknot. Is the left and right handed trefoil the same or different. That is, can you turn one trefoil knot into its mirror image. Mathematically there is a way to do this using "topological invariants". There are lots of ways to associate a polynomial to each knot. The one you should learn about and use is the Kauffmann bracket and the Jones polynomial. it was discovered by Vaughan Jones and he received the Fields Medal (often called the Nobel prize of mathematics) for this work and its relation to other types of mathematics. Read this introduction to the Jones Polynomial. More details and given in the first 10 pages of this document. See if you can compute the Kauffmann X bracket (or Jones polynomial) for the left and right handed trefoil knot. These previous two items are not easy! But are very rewarding as you are doing and learning something that was only discovered 30 years ago. I will help you! By playing around with string or by drawing try to figure out all the different knots that have 4 crossings. What about 5 crossings. Why do cables (eg of earphones) get spontaneously tangled. Do some experiments. DNA is very tangled/knotted. There is an enzyme called topoisomerase which cuts and rejoins DNA to help it untangle. There are nice animations on youtube. Euler Characteristic: How to tell the difference between a sphere and a torus? The wiki article is a good as place as any to start. Or another nice intro. There is a lot of accessible info on this. Cut the torus into polygonal pieces and calculate the Euler characteristic. Do this for the 2-holded torus. Try to generalize. What about the mobius strip. This topic can extend and generalize in many directions and there are lots of applications.